Contributions and Donations are always welcome, your support is appreciated! 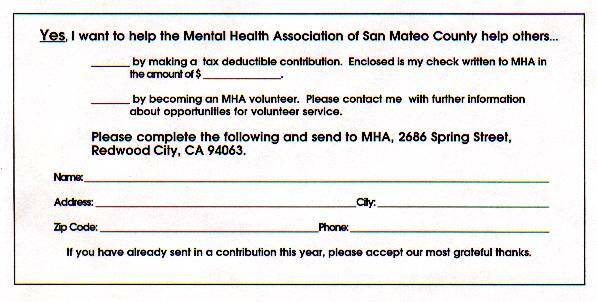 For the past 54 years, the Mental Health Association of San Mateo County has successfully gone the distance in active pursuit of creating services and programs for individuals and families suffering from mental illnesses. In just three years, we have made wonderful strides. We have purchased and rehabilitated a three story building in Burlingame comprised of five units for 11 individuals in private bedrooms. We have assessed and provided Occupational Therapy living skills support to 200 clients in San Mateo County who are living independently or planning to do so in the future. We have provided case management services to help young adults ages 18 to 23 with emotional, mental, or developmental/learning disabilities, and/or substance abuse issues achieve independence. We have purchased 2 properties in Daly City to provide 8 individual bedrooms for independent living and an additional 8 bedrooms for adults case managed by CAMINAR. Community contributions make it possible for us to continue to provide much needed services. We hope that you will consider to support the MHA this year as we would like to develop a permanent housing program in cooperation with the Veterans Administration in Menlo Park. We are also committed to maintaining our Spring Street Shelter for the homeless mentally ill, our daily social/recreation Friendship Center Program, and our housing assistance program for people with HIV or AIDS. We are proud of our accomplishments and will continue to expand housing options which are critical to our client's safety and well-being. We have been able to demonstrate that supportive housing, even in a shelter for the homeless mentally ill, reduces psychiatric hospital recidivism. In an age when every dollar must stretch as far as possible, it is obvious that new housing is imperative. We ask for your continued financial support as we strive to maintain and expand the network of support services for the mentally disabled and individuals in need. I hope you will continue helping us to help others.